Spiralizing is fun! Zucchini “noodles” cook quickly, making for a fast dinner. 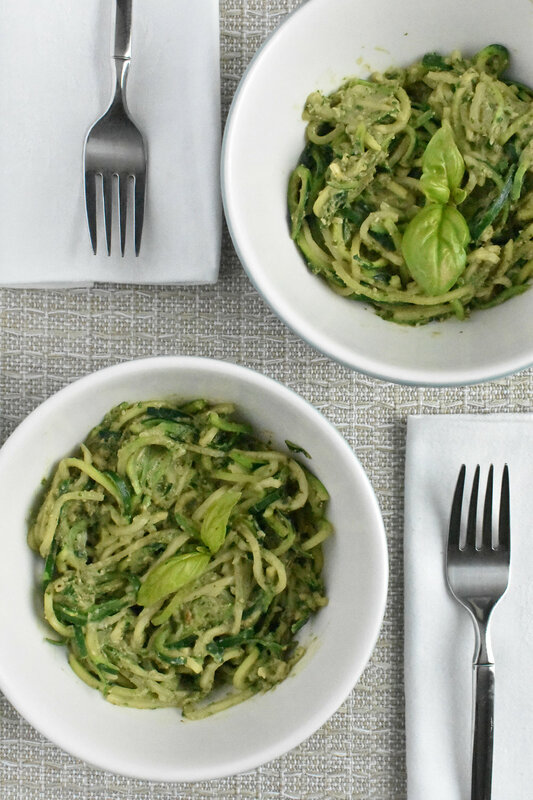 Pair it with a no-oil pesto and you’ve got a delicious, satisfying, healthy dish that’s light on calories. If you don’t have a spiralizer, use a small julienne blade on a mandoline slicer or other gadget. Grating isn’t a good choice because the zucchini gets too mushy. Creamy pesto sauce. Blend these together in a small (mini) food processor or with an immersion blender in a relatively small container. If you double the recipe, a larger food processor or blender will work. Add additional water if you need it. Zoodles. Trim the ends of the zucchini and spiralize them according to your spiralizer’s instructions. If you end up with very long strands, cut them to shorter lengths. Stir in the creamy pesto sauce, heat it briefly, and serve immediately.